The Indian banks in general, and the Public Sector Banks (PSBs) in particular, are grappling with the huge stock of stressed assets that has piled up in the system over the years. Any amount of discussion on the whys and what of stressed assets would therefore never be enough, if it enables us to discern what led to this phenomenal build-up of non-performing assets (NPAs) in our system and determine what we should do to solve them, and identify what could be done differently in future. I therefore compliment ASSOCHAM for organising a national conference on this topical issue and thank them for giving me an opportunity to share my views on the subject. I only hope this conference leaves us wiser about the problem at hand and the solutions to deal with it. I realise that the issue is complex and believe it will be naive to conclude that we go back with solutions that would work overnight. Even if you have heard this many a time, let me put the issue in perspective in terms of the magnitude and dimensions of the problem (Chart 1 and 2). The total stressed assets in the Indian commercial banks have risen to 11.5% with the Public Sector Banks leading the strain at 14.5% as at end-March 2016. They still contain some amount of restructured assets indicating potential for some more pain, albeit of lesser intensity. Let us now look at the year- on- year accretion to the NPAs. 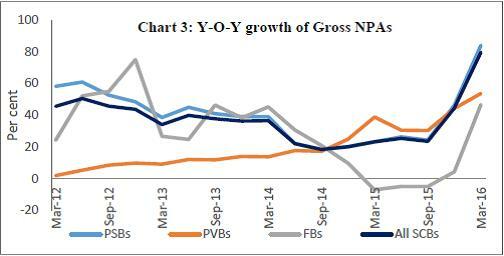 One could see that incremental accretion to NPAs is quite substantial (Chart 3). There was a big addition post-AQR exercise. What we need to realise is that, maybe, going forward addition to NPAs may moderate but the provisioning needs as the NPAs age will put pressure on the P&L. It would also be interesting to look at the sectoral distribution of NPAs and total stressed assets (Chart 4). It shows the obvious - the maximum stress in industry and infrastructure with the PSBs facing greatest strain across most sectors (Chart 5). During the five years to March 2015, banks have resorted to restructuring of loans in many cases to postpone recognition of non-performance, or what we now call ‘extend and pretend’, rather than using it as a tool to preserve the economic value of the units as intended. 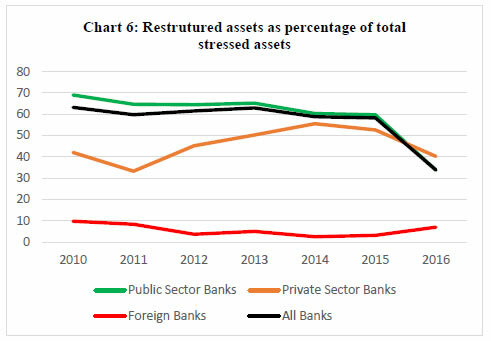 As a result, until 2016 the restructured assets constituted more than 50% of the stressed assets of all scheduled commercial banks masking the actual extent of deterioration of the loan portfolios (Charts 6). Down the years, as the stress deepened, these assets had to be classified as NPAs as work outs of non-viable units did not succeed. 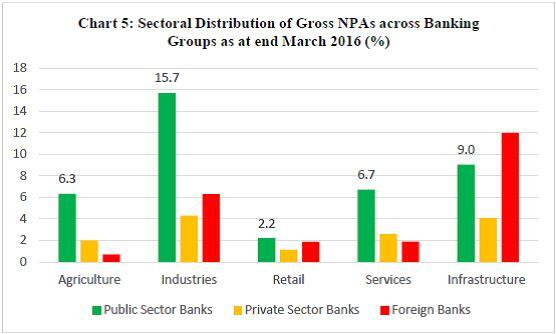 The Chart 6 shows that the proportion of these assets was much higher in public sector banks. The outstanding balance of these assets declined sharply in 2016 post-AQR, as a major portion of these assets has been classified as NPA post-AQR reflecting their true quality (Chart 6). 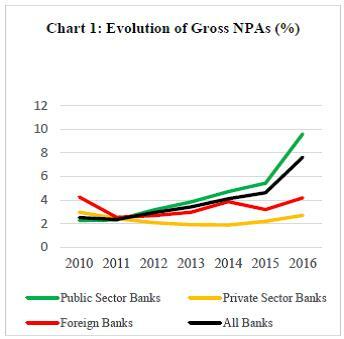 High levels of NPAs have been progressively causing increasing stress on banks’ earnings. 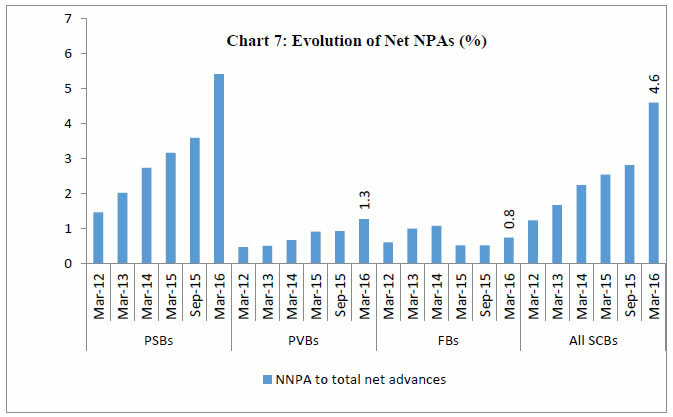 As a result, banks’ provisioning capacity has also come under pressure leading to a spike in the Net NPAs levels as well (Chart 7). Higher net NPAs indicate lower provision coverage ratio which should progressively improve as the strain on profitability eases. The reasons for the growth in the NPAs are also not far to seek. Table 1 and the Chart below show that the bank debt fuelled the rise in corporate leverage steadily from 2005 to 2011. It is worth noting that despite the 'high leverage' being a well-established and most widely known risk factor of corporate lending, bank lending to industrial sector continued at an average elevated rate of over 20 percent. Do we call this irrational exuberance? Obviously, an overly leveraged business is more sensitive to turbulence. Portfolio diversification is key to managing idiosyncratic risk. The banks’ credit portfolio leaves scope for improving the diversification both in terms of single name and sectoral concentrations. 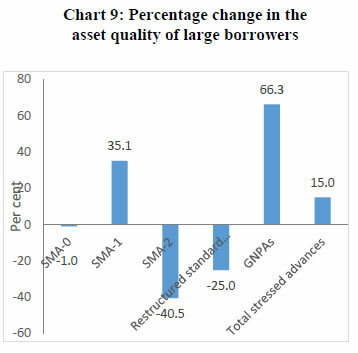 Charts 8 and 9 show that the stress is higher in large borrowers’ accounts. In the overall credit portfolio, share of industrial advances is around 40%. While this is partly justified based on the relatively higher credit intensity of industrial sector, the banks have to see the need for proper balance taking into account the risk return trade-off especially in the larger loan segment. The conference rightly highlights the key role of risk management in developing a less stressed loan book. Let me therefore examine the elements of a good credit risk management, look at the past and draw some lessons for the future. Banks are in the business of taking risks. If they are not taking risks they are not doing banking business. But, what does taking risk mean? Can it mean taking chances? When would a measured risk taking be different from recklessness? Essentially, risk management would involve knowing the risk, measuring it, and controlling it within the risk appetite of the bank by using appropriate mitigants. Let us therefore identify the various sources of credit risk. The first risk from credit management emanates from the possibility that the business does not take off as projected. It is likely that the project report based on which a credit proposal is submitted is highly optimistic. There is therefore a need to evaluate a proposal for how close the projections might be to reality. Even assuming that the projections were reasonable, there is the possibility that external factors might render the projections unachievable. The usual way to deal with this is to do a sensitivity analysis. The scenarios tested should be adequately stressed and plausible. They need to factor in the possibilities that arise on account of the fact that India is a lot more open economy now. Competition from abroad apart from domestic competition should be visualised and therefore global capacities and not just domestic capacity should be the criteria. Banks very often also undermine the forex risk embedded in cases which involve liabilities denominated in foreign currency. An important element of underwriting from a risk perspective will be the portfolio diversification. A credit portfolio which is exposed to concentration by counterparty, geography, economic activity and the like is more prone to shocks. There must be proper systems to monitor risks arising from concentration and systematically address them. We have allowed banks to have an exposure up to 15 percent of their capital to a counter party and 40 percent to a group. Banks must be wary of hitting these limits. Seven exposures of 15 percent each would make the bank’s capital vulnerable to the fortunes of a few companies. There is therefore a move to look at these limits differently. The linkages will not be through ownership alone but also economic relationships. An effective pre-disbursement control is a very important element of credit risk management. Banks are quite liberal in waiving sanction terms without being mindful of the risk mitigant they are letting off go in the process. Almost every condition of sanction is a risk mitigant. Sometimes there may be more than one serving the same purpose. A proper evaluation of the waivers, modifications and suggestion of alternate measures in substitution of waived requirements would go a long way in reducing credit risk. It is said that a poor underwriting can be made up by a strong post-sanction supervision and an excellently appraised credit can be marred by poor monitoring. Let me elaborate. Assume that the cost of setting up the plant was overestimated and passed off in appraisal. Tight control on release of monies and strong on-site supervision can still mitigate the risk. On the contrary, a lax post-sanction supervision can lead to the promoters not bringing in their contribution in time, money being used for purposes not part of the project cost, and the like. An important part of the risk management is the manner in which a stressed asset is dealt with. By definition one can say that a stressed asset is a loan in which anticipated and or unanticipated risks have manifested. Again the entire gamut of activities surrounding a fresh underwriting will have to be undertaken. But is that done? It is a matter of concern that the exercise is many a time directed towards postponing the recognition of stress. Therefore, restructuring of large loans became fashionable to a default that we had to finally put a stop to it. We realise that in any part of the world a going concern is better than a gone concern and it is more so in our country in the absence of a framework for dealing with insolvency. Hopefully, this will be overcome shortly, now that the Insolvency and Bankruptcy Act has been passed. But we are not clear why a bank cannot classify an account as NPA and still provide need based credit. The system of restructuring to prevent a downgrade of an account puts pressure on the banks because they are building further leverage in an already leveraged entity. What it is does is that it takes risk management away from the whole process. 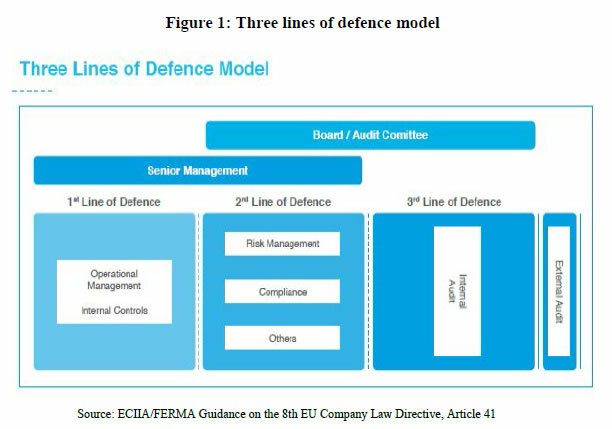 Theoretically, the “three lines of defence model” has been used traditionally to model the interaction between corporate governance and internal control systems of banks in the context of management of financial risks. I would explain it with the help of analogy to the three lines of defence in football game. In football, it is the front line forwards and mid-fielders who set the stage for winning the match. If they play with caution and strength, the rest usually follows smoothly. In credit risk management, the loan officers and the loan sanctioning authorities constitute the first line of defence. Being responsible for operational management, they have ownership, responsibility and accountability for assessing, controlling and mitigating risk in credit exposures together with maintaining effective internal controls. (Figure 1). If they ignore the basics while selecting a project for bank finance, the risk management, compliance and internal audits would have to work really hard to see that the loan turns out to be profitable for the bank. The credit risk management function constituting the second line of defence facilitates and monitors the implementation of effective risk management practices by operational management. Coming back to our football metaphor, the second line of defence has multiple roles. It has to keep a watch on how the forwards are progressing and whether they need to call them to modify the strategy. At the same time they have to be in readiness to react should the situation suddenly slip out of the forwards’ control. But, it would never be advisable for them to leave their place and join the forwards – this would expose the team to attack by the opposite team. Thus, the second line should only reinforce what the first line is doing, not to replace them. In credit risk management, the second line of defence should assist the risk owners- the credit department- in defining the target risk exposure and reporting adequate risk related information through the organisation. If this line of defence is to function effectively, this function has to remain independent. The credit risk management officers should not be part of the credit approval committees. The internal audit function is the third line of defence and is expected to provide assurance to the organisation’s board and senior management on how effectively the organisation assesses and manages its risks. They particularly look into the manner in which the first and second lines of defence operate. The assurance task covers all elements of an organisation’s risk management framework, i.e. risk identification, risk assessment and response to communication of risk related information. Comparing this with a football match, one would not expect the goalkeeper to be running with the forwards past the midfield to hit a goal. Also, a team cannot always rely only upon a strong goal keeper to win the match. In other words, an internal audit cannot solve all the risk management problems that primarily are the responsibility of the operational, risk management and compliance teams. RBI has issued detailed instructions to banks on credit risk management including the organizational and reporting structure of risk management and internal audit departments. If all institutional mechanisms have to function, they must be put in place to play the expected role and not just as a tick box compliance. Misaligned incentives for risk-takers in first line of defence, which primarily arise from the emphasis on generating sufficient revenue and profits for the institution. Lack of organisational independence of functions in second line of defence. Inadequate and subjective risk assessment performed by internal audit. Let me complete discussion on the three lines of defence with the role of the board and senior management. After all a big part of the game is won by strategising and mentoring. The players should have an executable plan that has assessed the opponent’s strengths and weaknesses. The board and the senior management draw up the risk strategy for the bank, set the risk appetite for the organisation and allocate roles to each player and group of players. They are thus like the coach and the manager of a team. Mind you, if you look at famous football leagues, the coach and the manager are an important part of the teams. If banks continue to remain saddled with huge NPAs for a long time, it would make them risk averse and choke the lending for economic activities in general. 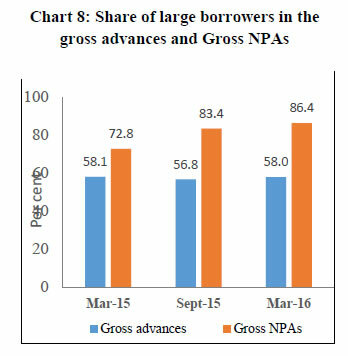 Another consequence is the likely shift by the PSBs to loan segments such as personal loans and housing loans where the banks so far have had lowest NPAs. While this may help in rebalancing the loan portfolio in favour of less volatile sectors, care would have to be taken not to overdo this and shift the leverage from the corporate sector to household sector. Yet another possibility is the rise in the market share of private sector banks in industrial loans. We are seeing this already. This would help the viable businesses continuing to have access to bank finance the broader banking sector is still under stress. However, these banks will have to manage the resultant credit concentration risk well. Overall, dealing squarely with stressed assets is crucial for the nation’s economic growth, which is why the RBI and Government have taken several measures in this direction. The consequences of default in loans are aggravated by poor recovery. In particular, the low rate of recovery through legal recourse is a cause for concern – the annual recovery as percentage of amount of cases filed under SARFAESI Act, with DRT and Lok Adalats fell from 20% in 2013-14 to 9% in 2015-16. With the Government having notified the amendments to the DRT and SARFAESI Act, we hope to see improvement in the recovery process. The Insolvency and Bankruptcy Code is yet another major step taken by Government in this direction. The Government has set up a Committee, with four sub-groups, to formulate detailed regulations and rules to operationalise the code within a short time span. The Government has also taken steps to improve the corporate governance of the PSBs. The Indradhanush initiative - breaking up the post of Chairman and Managing Director, strengthening board and management appointments through the Banks Board Bureau, decentralizing more decisions to the professional board and finding ways to incentivize management - would contribute to better performance of loan portfolio of banks. The Government has also pumped in quite a bit of capital into the banks. The phenomenal rise in non-performing assets of banks has engaged considerable attention of RBI too. 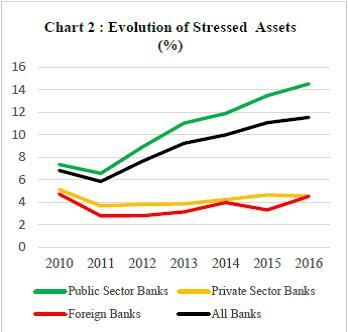 Starting from the framework for dealing with stressed assets in early 2014, we have initiated a series of measures to empower banks to deal with stressed assets. Realising that information asymmetry is a major bottleneck in sound credit appraisal and strong credit monitoring, RBI has created a large loan database (CRILC) that covers all loans over Rs.5 crore. The data base is accessible to all the banks. That database allows banks to identify incipient sickness that is reflected in repayment behaviour. Leveraging the CRILC database, lenders could coordinate their planning for recovery and resolution of the affected unit through a Joint Lenders’ Forum (JLF) once early signals of sickness are noticed. Incentives have been given to banks for reaching quick decisions. We have taken steps to ensure that the forum performs efficiently. RBI’s regulations require banks to classify loans into special mention categories based on days past due for better monitoring. While restructuring of loans per se is not a bad thing, we have almost put an end to the restructuring of unviable projects by banks and keep them classified as standard assets too. At the same time, 5/25 scheme has been designed with the objective of allowing the borrowers to take the benefit of better alignment of their repayment schedule to cash flows to service the debt for a long term project. We have been constantly monitoring the performance of the scheme and tweaking it wherever necessary to ensure that it is not misused to evergreen the weak loans and to iron out the wrinkles if any. The SDR scheme has been designed to deal with problem loans where promoters need to be replaced, whereas the ‘Scheme for Sustainable Structuring of Stressed Assets’(S4A) is an optional framework for the resolution of large stressed accounts without change of promoters. The S4A envisages determination of the sustainable debt level for a stressed borrower, and bifurcation of the outstanding debt into sustainable debt and equity/quasi-equity instruments which are expected to provide upside to the lenders when the borrower turns around. This provides an incentive to capable, but overleveraged promoters to perform and banks to continue to lend as the project is not deemed an NPA, if adequately provided for. Indian banks got into stress before full implementation of Basel III and revised IFRS which are designed to provide protection against system level stresses. In particular, the countercyclical capital buffers and expected loss based provisions would strengthen the banks and create sufficient cushions against systemic risk events. The essence of all the macro-prudential and countercyclical elements of Basel III is that they encourage banks to save capital in good times for use in bad times. For Indian banks, the stress has occurred before full implementation of Basel III and to that extent they have not had the benefits of this improved capital standard. Rather, as Basel III is being implemented during a stressed phase, Indian banks are under double pressure – to survive the current stress and implement Basel III. Hence, external capital support is essential. Government of India has already provided the required capital support to the public sector banks, although with some conditions regarding the performance. More capital will be infused as part of Indhradhanush. But it is necessary that the stressed assets-build up is contained and the banks get back to generating adequate internal accruals. We are hopeful that, once the pain is over, banks would emerge much stronger. While the RBI believes that businesses can get into financial difficulties and genuine business needs should be supported, malfeasance should be properly dealt with. We have, therefore, put in place a detailed system for identifying wilful defaulters and non-cooperative borrowers with attendant consequences to the borrowers who are so declared. We also believe that frauds should be sternly dealt with and have created a fraud registry. 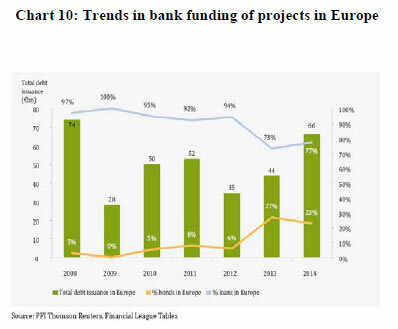 Bank loans continue to be a dominant source of project finance except in North America. However, owing to the considerable risks for the bank’s balance sheets that arise from such long term financing, capital market funding of project finance is being explored and consciously promoted in many other countries. For example, the bond funding of projects in Europe has increased from 3% in 2008 to 23% in 2014. (Chart 10). We have issued guidelines to make large borrowers to go to capital market for part of their funding needs. The revised draft on large exposure has been issued. We have also increased credit enhancement to be provided by banks for bond issuances to make them attractive for long term investors. Any bank which does not have a strong risk management is likely to build a highly susceptible credit portfolio. Risk Management is not static. It evolves over a period of time. It need not be the same for all. Its sophistication grows with the growth in the complexities of a bank’s functioning. In fact, if a bank’s risk management function is not commensurate with the complexity of its operations, it is prone to the risks manifesting and turning beyond its risk appetite. Regulators have put in place a framework for risk management. How well to operationalise it and how to ensure that the various lines of defence play their expected role are in the hands of the board and senior management of a bank. There is no line of defence stronger than a board and senior management committed to sound risk management in a bank. 1 Key note address delivered by Shri N. S. Vishwanathan, Deputy Governor, Reserve Bank of India at National Conference of ASSOCHAM on “Risk Management: Key to Asset Quality” in New Delhi on August 30, 2016. Assistance provided by Shri Rajinder Kumar, Chief General Manager is gratefully acknowledged.